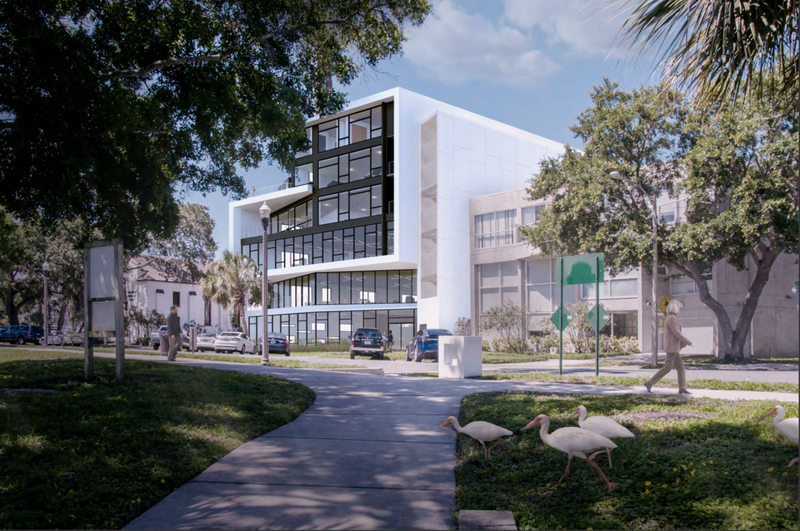 In many ways, the growth of Wannemacher Jensen has paralleled the growth of Downtown St. Pete — it’s hard to walk around downtown and not see a project they haven’t worked on. You can see their work in the renovations to Bayfront Tower at 1 Beach Drive SE, and the interiors of the recently opened Pacific Counter restaurant on the 600 block. And if you’ve visited the The James Museum of Western & Wildlife Art, they helped design that too. Speaking of their clients, they’ve also designed the interiors of the current UPC Insurance building located at 200 2nd Ave S. Recently, UPC Insurance was selected by Mayor Rick Kriseman to purchase a prime lot at 200 1st Ave S in order construct a new 150,000 square foot headquarters which has the potential to add hundreds of new jobs in Downtown St. Pete. Wannemacher Jensen’s commitment to St. Petersburg is partially what’s driving them to expand at their current location. 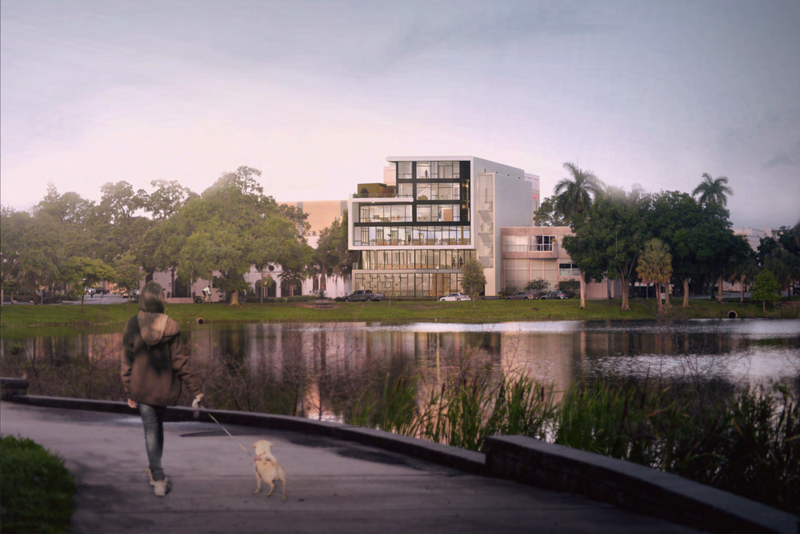 Just south of their existing office, at 132 Mirror Lake Drive, they are proposing a stunning six-story modern building overlooking Mirror Lake. The building features a floor-to-ceiling windows, some of which protrude at gentle angles, giving the building texture and an ultra-modern look. “The building will reflect Wannemacher Jensen Architects dedication to progressive sustainable design and community building,” says Principal Jason Jensen. The building will feature 17,000 square feet of office space located on floors one, two, and three — part of which will be used to house the offices for both WJ Architecture and WJ Create. The remaining office space will be for lease and WJ is currently seeking tenants who desire contemporary office space in a distinctive building. The fourth, fifth, and sixth floors of the building will house 10 residential units which will offer unparalleled lake and city views. While the residential units will be rented as apartments, they are being built to condominium standards. The project is currently in permitting. If all goes according to plan, construction will begin in January 2019 to be completed by the end of 2019 and will be ready for tenants by January 2020. Office tenants may begin tenant build outs in 2019.